A very special cat, but aren’t they all? Her real name was Feliz Navidad Grace Rhoda Moss. Feliz Navidad because she arrived around Christmas time. Grace because by the Grace of God she survived. Rhoda because she was found on a road. Moss because she became a Jacci cat. There had been an ice storm the day before Feliz arrived. She had been seen on the road but left for dead as she was frozen to the road. A person who had already driven by her had just assumed she was dead. When he went by her many hours later, she raised her head ever so slightly and he ever so gently shoveled her to get her unstuck. He took her then to a friends house who wrapped her up in warm towels from the dryer and brought her to FFRC. She was suffering from severe hypothermia and neurological problems. The first two days was touch and go. Each day was a struggle. Just breathing the first two days was hard. The most wonderful thing though–Feliz purred. For the first days she was non-stop purring. On day 4 she tried to stand and on day 5, she could walk, but in tight circles. Over and over again. But she did start her real journey back on that day. Her ordeal left her with neurological problems. She had seizures but they were able to be controlled. She was a survivor. Because of her, FFRC started the Feliz Navidad Medical Fund. It was set up to have funds available for those cases where there are extraordinary medical costs. 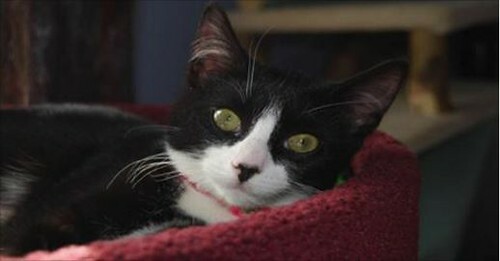 Feliz became one of Jacci’s house cats which she loved. At times she would become extra excited and she would then start her circling up again. She was a very happy cat and loved to be cuddled. Then in 2013, her seizures came back with a vengeance. They could not be controlled. With much sadness, Feliz Navidad was sent on her way to kitty heaven. She was and is still missed so very much. Her “job” continues. We still have her Feliz Navidad Medical Fund. It has literally saved many lives. If you are interested in contributing, please feel free to send a check (payable to FFRC) or a PayPal and mark it for The Feliz Navidad Medical Fund. We thank you.